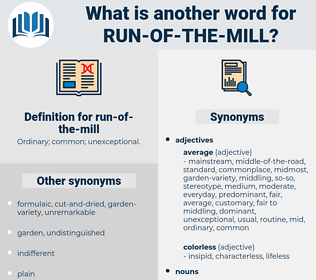 What is another word for run-of-the-mill? 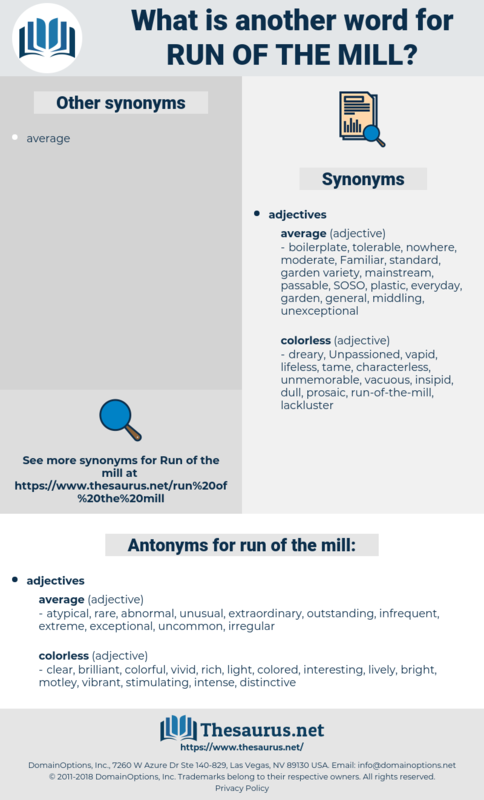 mediocre, mundane, trite, banal, commonplace, trivial, corny. nifty, way out, odd, fantastic, out-of-the-way, outrageous, special, top, superior, tip-top, lacking, singular, weird, marvelous, number one, peerless, maximum, superb, swell, eccentric, peculiar, unusual, kooky, nonconformist, idiosyncratic, terrific, recherche, top-notch, oddball, sensational, wacky, inadequate, wild, unsatisfactory, first class, novel, fine, quaint, distinguished, unsurpassed, phenomenal, outre, capital, great, irregular, rare, supreme, unacceptable, far-out, aberrant, curious, deficient, choice, freakish, wanting, unmatched, exquisite, excellent, anomalous, splendid, insufficient, fabulous, bizarre, outstanding, conspicuous, prominent, signal, unparalleled, optimal, A1, unprecedented, offbeat, stellar, unorthodox, preeminent, optimum, first-rate, atypical, scarce, unconventional, unique, classic, grand, salient, freak, striking, untypical, abnormal, matchless, notable, prime, unexampled, par excellence, sterling, funny, superlative, strange.